Granted the inventory classes are different (M for $473, S for $332) but why doesn't the roundtrip search find the cheaper fare? As American Airlines and US Airways are still operating as distinct airlines, this question is being moved to the appropriate pre-merger airline forum. Please note the sticky at the top of the consolidated thread which is titled PLEASE READ ME BEFORE POSTING! Welcome to the New American Airlines Forum!. With all of the changes about, it is important to know where to post, and reading that thread before posting (as the title suggests ) will help get you in the right place. I don't think the AA site "breaks" fares (nor would I expect it to); it just finds the cheapest fare in the market you asked (e.g. RDU - DTW). Great work on your part doing it though! Not the way I see it. It's just exposing that airlines don't show you the lowest fare available, when lower fares are available. That's certainly not customer friendly. I have encountered tons of such situations and had to go to OTA to book them, just because the AA website will loop. Did any of the search tools like kayak, ita or hipmunk show the lower fare? Sometimes kayak (when priced via orbitz). I found the fare on ita and hipmunk ONLY when providing more info, such as connecting points. Were you actually able to book the lower fare? There's a comment on the linked website that tries to explain what AA (or DL or UA) are doing. Because of married segments, DTW-RDU (via ORD) only has M availability. 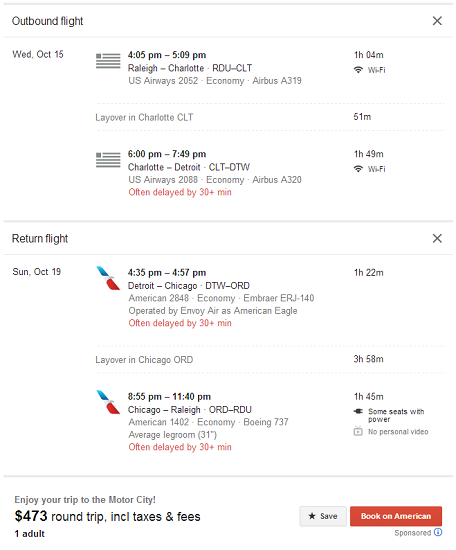 Even though DTW-ORD and ORD-RDU both have cheaper S availability when searched separately or in multi-city. 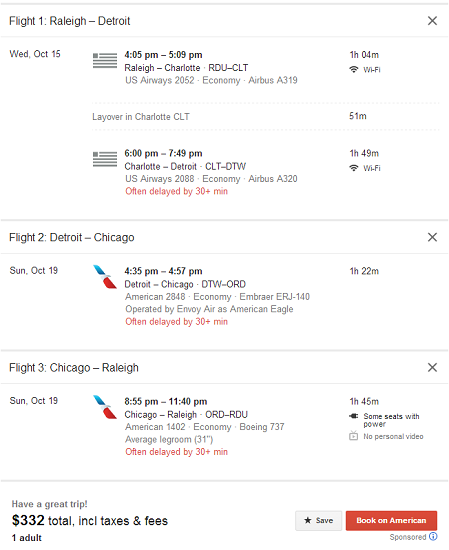 I think AA.com does break fare. As recent as my trip on past July 4th weekend I did buy ticket from AA.com by simple round trip search of CLE-DCA. The return DCA-CLE was constructed by DCA-ORD on L fare and ORD-CLE on V fare. Thought maybe ORD-CLE portion being Envoy Air had something to do with so I looked my booking further back and last year when I purchased simple IAH-LAS round trip on AA.com the return trip was LAS-DFW on Q fare and DFW-IAH on N fare. Just realized after posting the above, looks like OP was not searching fares on AA.com. Is it possible that search website has something to do with...? I have seen similar behavior in the past but wasn't actually able to book the multicity version. My experience is that AA.com will return the lower fare when manually built but wlll not allow me to book it- error messages appear. I've done this several times for personal trips and have had no issues. Was concerned AA might cancel them, but IME they haven't.